Diuretic Agents are a class of drugs that you will see given to patients in the medical field as a Respiratory Therapist. Basically, a Diuretic is a medication that increased the production of urine. These drugs have certain effects on the body that you definitely need to be aware of. 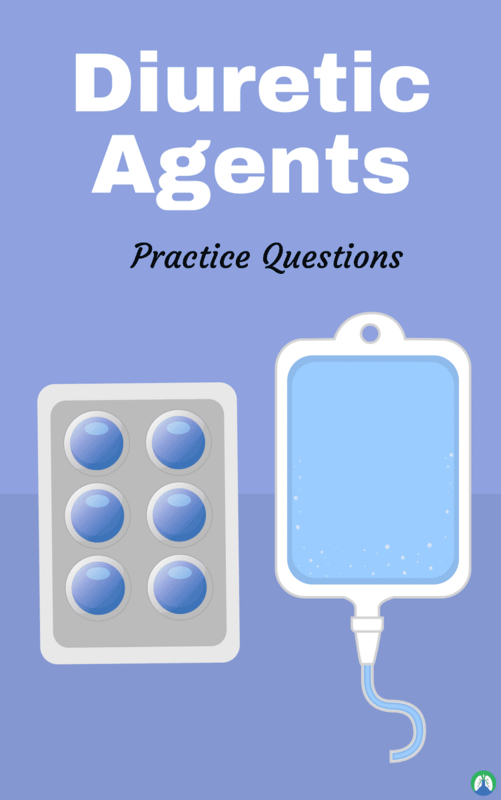 This is why we built this study guide for you, loaded with helpful practice questions about Diuretic Agents that can teach you everything you need to know. Are you ready to get started? 1. What is the main purpose of diuretics? They are used to eliminate excess fluid from the body. They help to promote the production of urine. 2. What are the primary goals of diuretics? Lower blood pressure and rid body of excess interstitial fluid. Swelling caused by abnormal accumulation of fluid in intercellular spaces of the body. 4. What is glomerular filtration? The mechanism whereby fluid in the blood is filtered across the capillaries of the glomerulus to be eliminated through the renal ducts. A decrease in total blood volume. 6. What is a common diuretic that we hear most often as a Respiratory Therapist? 7. What is a nephron? Functional unit of the kidney; responsible for regulation concentration of water and electrolytes; maintaining fluid balance; maintains homeostasis of internal volume; and, each kidney has approximately 2 million of these. Damage to the hearing or balance functions of the ear caused by drugs or chemicals. 9. What does synergistic mean? Effect of 2 drugs on an organism is greater than the effect of either drug alone. 10. What is the normal urine output for a person per 24 hours? 11. What is the nephron composed of? Glomerulus, proximal tubule, loop of Henle, distal tubule, and collecting duct. 12. What is the osmotic diuretics mechanism of action? Reduction of reabsorption of H2O and solutes. Fast-acting agent. 13. Where is the osmotic diuretic location? Primarily on proximal tubule and descending loop of Henle. 14. What are the osmotic diuretic indications? For cerebral edema in acute emergency care settings and head trauma. 15. What are examples of osmotic diuretics? 16. What is the carbonic anhydrase location? The luminal membrane of the proximal tubule. 17. What are the indications of loop diuretics? HTN (hypertension), CHF, ARF, CRF, Ascites, Nephrotic Syndrome, and Hemodynamic Effect (acute vasodilation and decrease blood pressure). 18. Where is the loop diuretics location? 19. What are examples of loop diuretics? Furosemide (Lasix), Bumetanide (Bumex) and Torsemide (Demadex). 20. What are the indications for thiazide diuretics? First line for mild HTN, CHF, and idiopathic hypercalciuria. 21. What are potassium-sparing diuretics? Spironolactone (Aldactone) and Eplerenone (Inspira). 22. What are the indications for potassium-sparing diuretics? Chronic liver disease, may cause hyperkalemia and given to patients with potassium problems. 23. Where are potassium-sparing diuretics located? 24. What are the adverse effects of diuretics? Hypovolemia (dizziness, extreme thirst, excessive dryness, decreased urine output, constipation, acid-base disorders), ototoxicity, and glucose changes. 25. What are some special situations where we may not want to use diuretics? Not recommended during pregnancy or for breastfeeding women. Lasix is effective/least toxic in pediatric practice. 26. What is the primary goal of diuretic therapy? Lower blood pressure and rid the body of excessive interstitial fluid. 27. What are five major groups of diuretic drugs? Carbonic anhydrase inhibitors, osmotic, Thiazide, loop, and potassium sparing. 28. What is the osmotic diuretic mechanism of action? Reduction of reabsorption of water and its solutes found in the descending loop of Henle and prevents passive reabsorption of water. It is an osmotic diuretic. It is non-toxic, freely filtered, non–reabsorbable and non-metabolized. Given for cardiovascular diseases and administered prophylactically for acute renal failure. It can lower ICP if infused. 30. What are the side effects of carbonic anhydrase inhibitors? Rapid tolerance building, increase bicarb excretion, metabolic acidosis, drowsiness, fatigue, CNS depression, paralysis (pins and needles) and renal stones. 31. What the carbonic anhydrase inhibitor drug names? 32. What are the loop diuretic mechanisms of action? Inhibit sodium, potassium and chloride reabsorbed; inhibit in the ascending loop of Henle; “Lock and key” receptor mechanism; and, enhances magnesium and calcium excretion. 33. What are the main indications for loop diuretics? Hypertension, CHF (left heart failure) and acute and chronic renal failure. 34. What are the side effects of loop diuretics? Hypokalemia, hyper uremia, metabolic alkalosis and depletion of magnesium. 35. What are the main indications for thiazide diuretics? Hypertension, CHF, calcium deposit stones, osteoporosis, diabetes insipidus (decrease peripheral vascular resistance, narrow therapeutic margin) and first line treatment for mild hypertension. 36. What are the side effects of thiazide diuretics? Depletes potassium, increases sodium exchange in chronic renal failure and hyperglycemia. 37. What are the commonly used thiazides? 38. What are some examples of potassium-sparing diuretic drugs? Spironolactone (Aldactone) and Eplerenone (Inspra). 39. What are the main indications for potassium-sparing diuretics? Chronic liver disease, renal artery stenosis, adrenal hyperplasia, CHF and cirrhosis. 40. What are the side effects of potassium-sparing diuretics? Can increase potassium too much and glucose intolerance for diabetic patients. 41. What are the side effects of any diuretic? Hypovolemia and acid-base disorders are most common. Hypokalemia and hypocholemia; glucose changes; and, ototoxicity. 42. What conditions might the patient need a diuretic? 43. How does a diuretic help with edema? They help get rid of the edema. 44. What part of the kidney is responsible for the majority of sodium reabsorption? 45. What is the enzyme is required for the bicarb reabsorption process on the brush border and in cytoplasmic? 46. What drug inhibits carbonic anhydrase in brush border and cytoplasm? Acetazolamide. It works in the PCT but also inhibits it in all tissues of body. 47. What does carbonic anhydrase do? It plays an important role in the secretion of CSF and aqueous humor. 48. What is the effect of acetazolamide in the CNS? Causes acidosis of CSF resulting in hyperventilation that protects against high altitude sickness. 49. What is the major renal effect of acetazolamide? Bicarbonate excretion, metabolic acidosis results and causes potassium wasting (self-limiting 2-3 days). 50. Why would a loop diuretic cause hypokalemia? Large amounts of sodium in the lumen may result in significant potassium wasting and excretion of protons. 51. Why do NSAIDS decrease the efficacy of most diuretics? Prostaglandins are important in maintaining GFR. 52. What is a random application of loop diuretics? They can serve as a treatment for severe hypercalcemia. 53. What is an important toxic side effect of loop agents? 54. How do thiazides cause hypercalcemia? Decreased sodium transport from the lumen into the tubular cell reduces intracellular sodium and promotes sodium/calcium exchange at the basolateral membrane. Increases calcium reabsorption from urine (opposite effect of loop diuretics). 55. What part of the kidney does reabsorption of water occurs under the control of ADH? 56. How do osmotic diuretics work? Freely filtered at glomerulus, but poorly reabsorbed from tubule. Remain in the lumen and hold water by the osmotic effect. 57. Other than diuresis, what can mannitol is used to do? Reduce brain volume and intracranial pressure by osmotically extracting water from tissue into blood. Similar effect occurs in the eye. 58. What osmotic diuretic used to treat increased intracranial pressure? Disorder in which there is excessive accumulation of calcium in the kidney parenchyma and tubules. So there you have it! That wraps up our study guide on Diuretic Agents. I hope that these practice questions were helpful for you. Oftentimes, as a Respiratory Therapist, you will get called to give a breathing treatment for a patient that is wheezing due to fluid overload. This is a perfect scenario where you would want to recommend a Diuretic instead (i.e. Lasix). Keep the information that you learned from this study guide in mind and if will definitely help you through your career. Breathe easy, my friend.